A quick follow up to the blog post comparing different types of paper. Since there has been some interest in this topic, here the diagram with the samples above the plots. 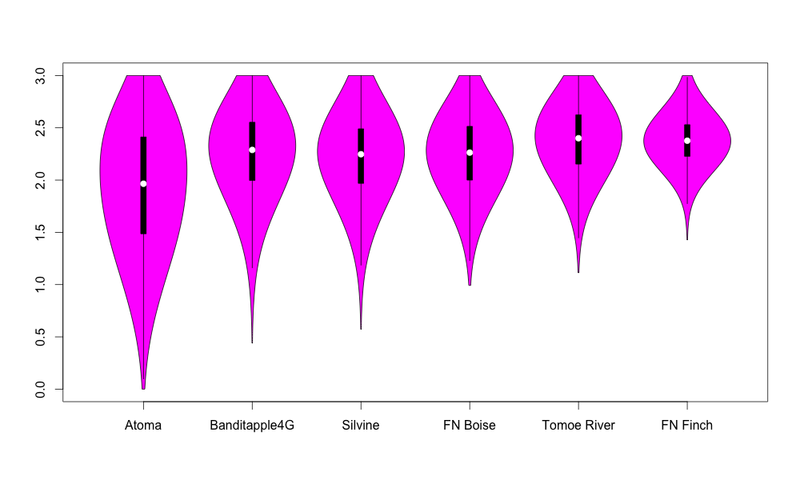 A sample with not much variation results in a condensed violin plot, which is easy to see here. It doesn’t seem to matter if a paper as lots of areas the lead can’t reach, i.e. parts that stay white. As long as the dark areas are properly dark the mark left by the paper feels dark. For quite a while I’ve been planning on having a closer look at how different paper performs for pencil use. Well, I thought I better have a closer look. Long term, i.e. if this is of interest to readers, I plan on also measuring how abrasive the paper is, but I haven’t found an easily reproducible way of doing that yet that can be measured accurately, so I am focussing on how dark a line the different papers will produce with the same lead. Following Kent’s post about the Lumograph being a good standard pencil, because it is good, not expensive and available world wide, I wanted to use the Lumograph, but for several reasons (I don’t want to bore you with them) I went with the next best alternative: Staedtler’s mechanical pencil lead. I try keep it short, but more details are available if there is interest. Lead used: Staedtler lead, 0.7mm, the one that came with the Mars micro. I assume it is HB, but I have added a Staedtler 0.7mm HB lead to a recent order from The Pen Company, so that I can use those leads for future comparisons. As seen in this blog post a 0.7mm lead has a diameter of 0.68mm, that’s a surface area of 0.36mm2. With a pressure of just over 4 MegaPascals the equivalent force used on an 0.5mm lead to produce this pressure would be 1 Newton. I found these parameters to be a suitable trade off between force and diameter size. More force means more problems with me providing consistent, reproducible results. The obvious way out would be to reduce the lead size (= more pressure per square mm), but a smaller diameter means measuring the lead’s darkness becomes more difficult and less representative. Some quick comments on the paper. Great and extremely dark for pencils. So unusually dark that you can easily switch to a harder pencil grade and get a similar darkness compared to other paper. My wife started using an H lead for writing in Atoma notebooks. 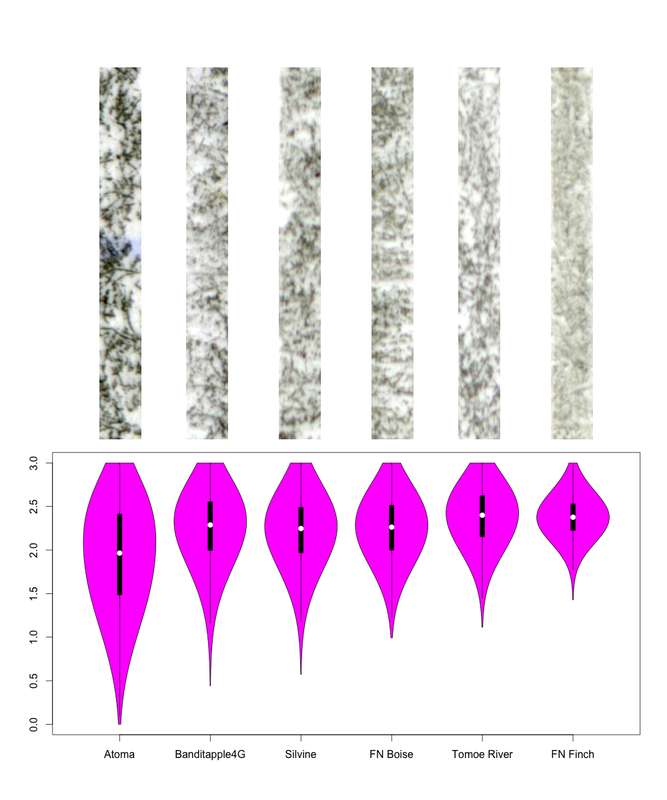 I did a control sample to confirm that the plot shown in the diagram is correct. As always great paper! This is the latest generation of Banditapple paper: 4G, just released. Very common in the UK. Most Post Offices will sell Silvine products, but unfortunately the red Memo Books have become a rare sight. 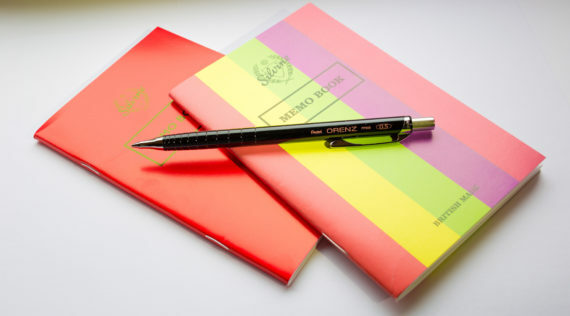 Silvine is planning to revive their red notebooks. Used in County Fair Field Notes. Great paper. Very light and smooth paper. I expected a smaller standard deviation. The notebook used is a handmade notebook from Shangching, previously seen in this video. 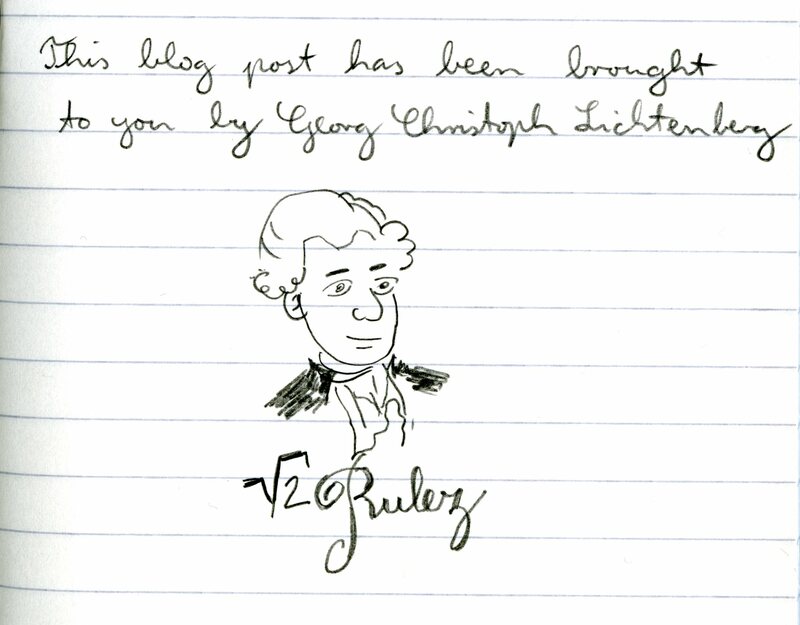 Used in the Original Field Notes. I don’t like it for pencils. I should probably switch to using softer pencils in this notebook, then this paper might be alright. Also not good for fountain pens. The diagrams show the distribution of dark and light marks left by the lead on he paper. 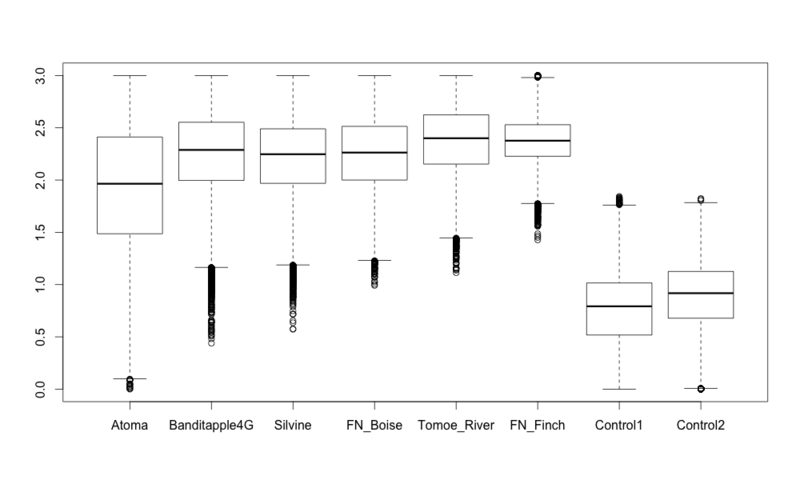 I first planned on using box plots. I have heard that they even teach box plots in school these days, but I went with violin plots instead. 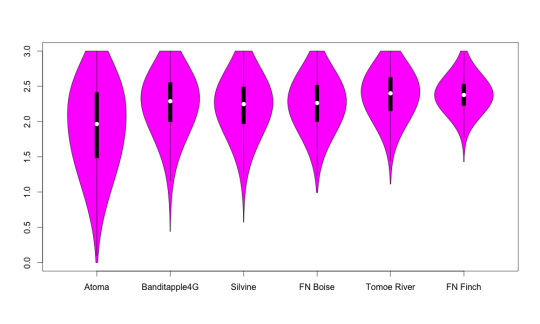 violin plots are basically box plots with a rotated kernel density plot on each side. I thought this provides more information, compared to box plots, in the same space. I have taken samples of exactly the same size from the mark left by the pencil on all these papers. In the diagram 3.0 represents white, 0.0 represents black, so you can see the distribution of dark and white in the mark left by the lead on the paper. A darker mark, like the one on Atoma paper, will show as a plot further down (closer to 0.0) in the diagram. Smoother, finer paper should produce less variation, i.e. a more even colour, so the plot should be more condensed. Rougher paper should have more ‘peaks and troughs’ on the surface, so the darkest areas should be darker and the lightest areas should be lighter, resulting in a stretched plot. 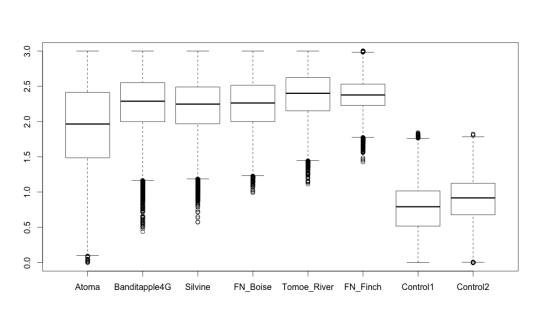 There are two control samples, only visible in the box plots. 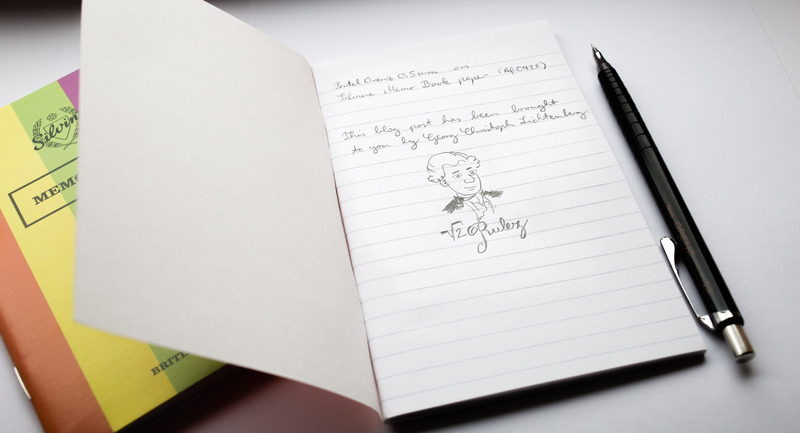 They are taken from the cover of Field Notes Byline edition. They are just used to see whether using different samples in different scans will produce close enough results in the plots. 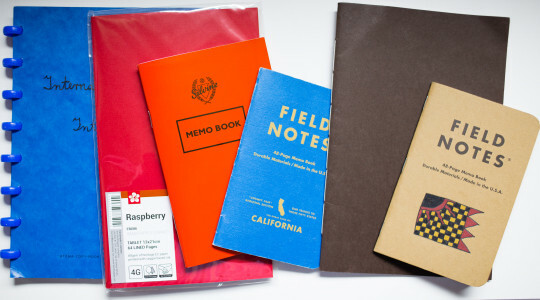 If this is of interest I could look at the different types of paper used in different Field Notes. I could put the R code used to produce this on GitHub. I also have a great paper sample pack from Scribble I could have a look at. Long term the darkness could be plotted against the abrasiveness of the paper. If there is at least one comment on this blog post I will continue exploring paper, if not I will write blog posts about topics other than paper that might be more interesting, e.g. pencils. I bought this Orenz from eBay seller Morgan’s Direct for £4.99 (~$7.30; €6.50). You might have seen my Facebook post about the recently released 0.5 mm and 0.7 mm version of the Orenz and about the Orenz Mannish Line that will be released in June. The Mannish Line has some interesting colour combinations. Very tempting. The Orenz in 0.5 mm and 0.7 mm doesn’t seem to be available in Japan. The one I bought was the official UK version, but made in Japan, of course. The 0.3 mm version of the Orenz needed quite a bit more force to slide the sleeve than the 0.2 mm version, see the sliding sleeve table for more information. This made me think that the 0.5 mm version will need even more force to slide the sleeve, but to my surprise that was not the case. While the 0.3 mm version needs more than 0.1 Newton, the 0.5 mm version needs only about 0.1 Newton. That’s still more than the best 0.5 mm pencil, the Staedtler Microfix S, but as far as I know, this is the best value for a pencil currently in production. Using different leads might result in different values, but both the 0.3 mm and the 0.5 mm version of the Orenz were tested with the original leads they came with. Overall: it’s a fantastic pencil. Pentel’s pencil designs are very polarising for me, I either love or dislike them, but the Orenz has a design I really love, unlike the P20x series liked by many, but not me. It’s a shame that this pencil is only available in black. Pentel, please release it in other colours, too. Price and exchange rate: May 2016. This mechanical pencil has been added to the sliding sleeve table. …and at Lexikaliker, who was probably the first outside Japan to write about this pencil. 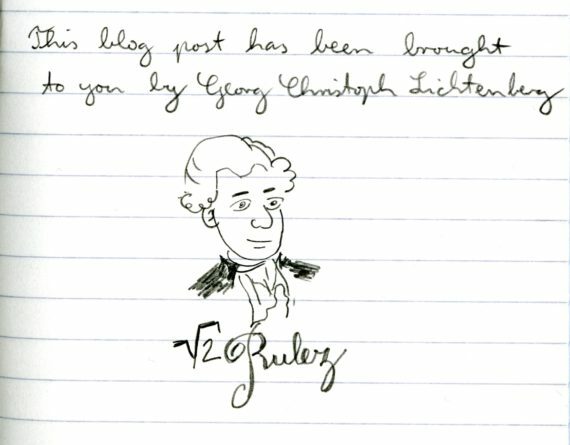 You can read more about Georg Christoph Lichtenberg at Wikipedia. The notebooks in the photos are Silvine Memo Books. Today: another pencil from France. This time it’s an eco pencil, the BIC ecolutions evolution BLACK. It’s a really good looking eco pencil with gold lettering on a dark grey, slightly metallic looking body. I paid £1.49 (~$2.35; €1.80) for a set with four pencils from a local supermarket. When I first saw the packaging I was sceptical – it looks good, but does it write well? Most eco pencils don’t write very well, with the Wopex and paper-rolled pencil being the only exceptions I find usable. “Relatives” of this pencil have been reviewed at pencil talk and Lexikaliker. Unsurprisingly the BIC ecolutions evolution BLACK seems to be very similar to these pencils. The box indicates that it’s made form 55% recycled material and looking closer this seems to be an extruded pencil with an aerated casing. The pencils seem to have more air bubbles in the centre of the body, near the lead. I thought an eco pencils deserved a suitable sharpener, so I tried out the Dux Bio, a sharpener being advertised as 100% compostable and made from 80% renewable resources – even though I think it might be biodegradable rather than compostable, i.e. it the sharpener probably doesn’t turn into humus . A quick word about the Dux Bio, also known as the DX5907. It’s a great sharpener that produces an even point with an angle of ~24°, even on difficult to sharpen pencils. I actually tried to get my hands on one for a while, but wasn’t able to find it anywhere. In the end (about 18 months ago) Dux was kind enough to send me one. Sharpening this pencil is fairly easy for a pencil with a body made from recycled material other than paper. 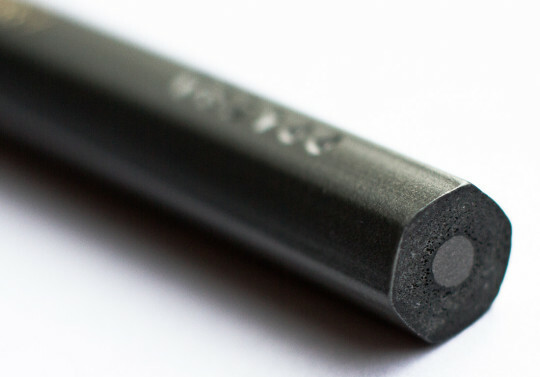 The graphite core looks similar to that of a traditional pencil, but when looking at a sharpened point the graphite seems to be more reflective. The BIC ecolutions evolution BLACK produced a fairly light line – so light that it is tempting to press harder, especially if the point has been used for a while and the line is wider. 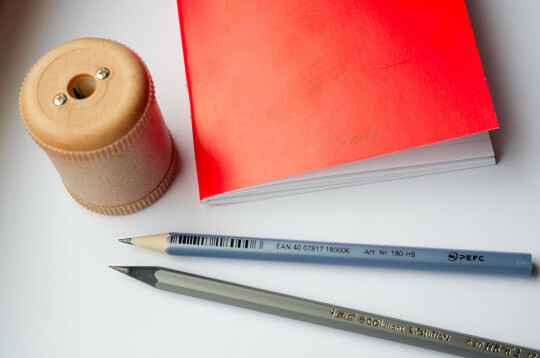 Unlike a more traditional pencil pressing harder doesn’t however result in a darker line – or should I say the causal relation between pressing harder and producing a darker line is not as obvious as it is with a normal pencil. Overall it’s not bad for a recycled pencil. It’s certainly much better than the recycled pencils made by Remarkable, but even though it’s easy to sharpen it doesn’t produce a line as good as the Wopex. 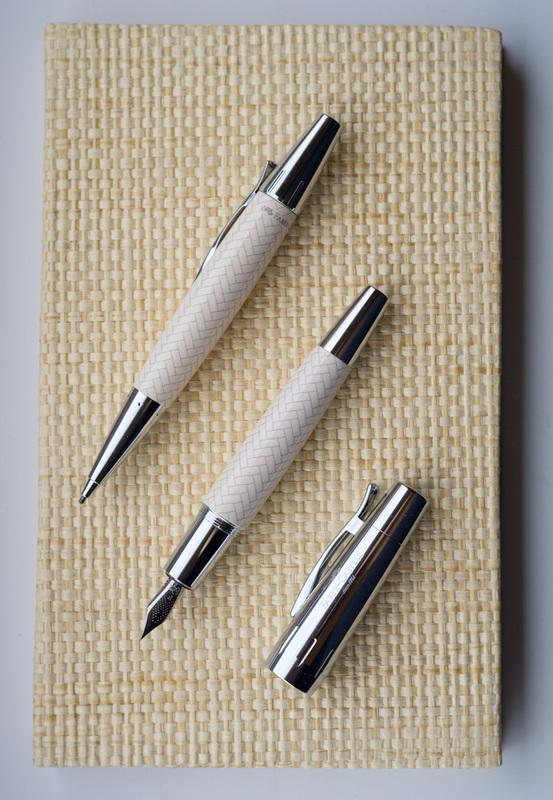 Both E-Motion pens on a teNeues Explorer Journal Hay Harvest. It took quite a while before I bought my first Faber-Castell fountain pen. Now, only a few weeks after, I had the opportunity to try another Faber-Castell fountain pen, as well as the mechanical pencil from the same line. I have been recently contacted by Anna from The Pen Company who asked me whether I would like to review a pen from their shop. In the end James from The Pen Company was kind enough to not only to send one, but two pens I had picked: the Parquet Ivory fountain pen and the Parquet Ivory mechanical pencil from Faber-Castell’s E-Motion line. I was also able to try Faber-Castell’s wooden Castell 9000 style 4GB USB stick out. As part of a promotion you get one of these USB sticks with orders of all Faber-Castell pens while stocks last. Both pens come with an ivory coloured “precious resin” barrel. The parquet pattern on the barrel has been produced using laser etching, a technique often used for keyboards. There is a tiny burr visible on the barrel if you look hard. This burr is slightly more pronounced on my fountain pen, but it is really small. Most people wouldn’t even notice it. The mechanical pencil accepts 1.4mm pencil leads and comes with B leads. Size-wise these are between Yard-O-Led leads and the leads used in leadholders. I assume that unlike leadholder leads, which are usually sharpened, the Faber-Castell leads are not supposed to be sharpened, as I haven’t seen a dedicated lead sharpener from Faber-Castell. My handwriting is very small, which means that even if I frequently rotate the pen the lines get too wide and I have to starting writing bigger letters – but the lead size might be just right for someone with a bigger handwriting. To propel the lead you have to turn the cap clockwise. Similarly you can get the lead back into the body of the pen, e.g. when putting the pen in a pencil case, by turning the cap anticlockwise. This is different to twist-based mechanisms where turning will unlock and advance the lead. The E-Motion‘s lead stays ‘locked’ all the time. There is also an eraser under the cap. As expected for the big size of the pen’s body this eraser is bigger than what you usually find in mechanical pencils. When you unscrew the cap you can find a storage area on the side of the body that should be able to hold six to eight replacement leads. Unfortunately I couldn’t try out how many exactly will fit as I didn’t have enough leads of this size. A very nice pencil. The spring-type clip is very nice. 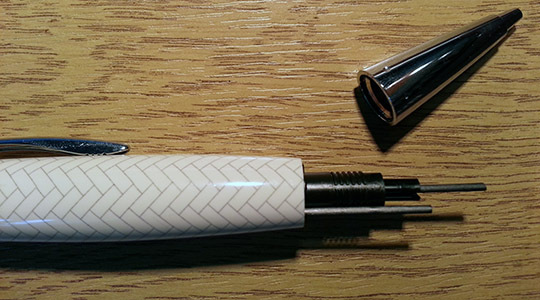 There is a big eraser for emergencies and the pen can hold several spare leads despite the big diameter of the leads. If normal pencils are to thin or light for you this might be a great alternative, as long as you don’t mind the width of the lead. The fountain pen comes with a big and heavy screw cap, that has a nice spring-type clip, like the one found on the pencil. 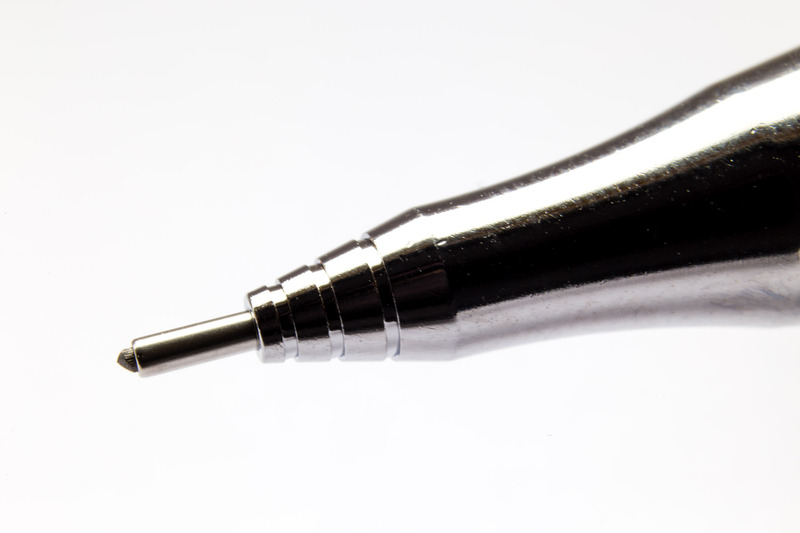 The nib is stainless steel, available in F, M and B. I chose the F nib as it fits best with my handwriting. The pen accepts standard cartridges and comes with a converter. The laser-etched Parquet pattern on the fountain pen. There is no etched logo. The logo is embossed on the cap. The bleed through of the E-Motion compared to that of a Lamy Safari, here on Silvine paper. The nib is nice and smooth and writes well on all types of paper. I found that the writing experience is above average on really poor paper. When it comes to average paper performance is good, but not as good as some other fountain pens. I used the E-Motion with Diamine’s Sapphire ink, a very well behaved ink. 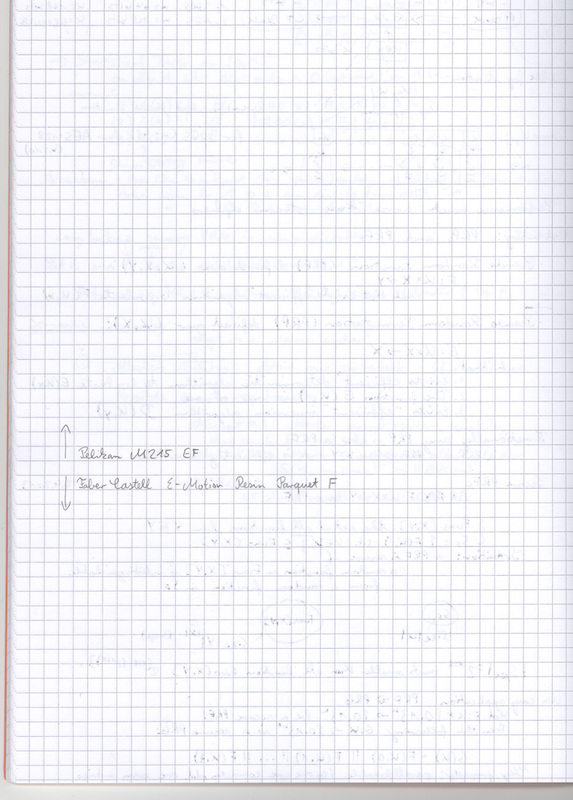 On average quality paper, in this case a Yokrshire-made exercise book from Silvine, there is no feathering at all – but there is some bleed through: it’s much less than the bleed though you get with a wet Noodler’s Konrad, a bit more than with a Pelikan M215 EF and more than with a Lamy Safari F, which doesn’t produce any bleed through at all. The bleed through issue be easily fixed by using different paper or by trying to make the nib drier1. When freshly uncapped I never had any problems with skipping, unlike my experience with some other, more expensive fountain pens, like the Cross Century II. 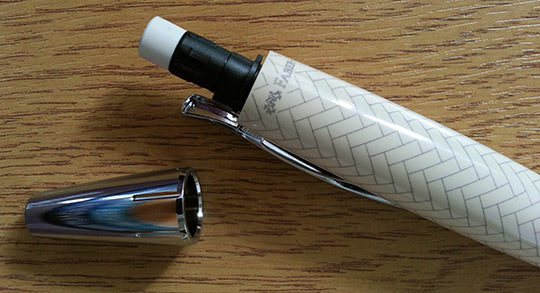 The cap-off time time of the E-Motion is however shorter than some other fountain pens. Left uncapped it tends to dry and start to skip when starting to write again after two minutes non-use, which might be a problem when taking notes in a meeting or in some other situations (classroom, writing comments, …)2. A very nice fountain pen. It is heavier than many other fountain pens and the grip section doesn’t provide as much grip as some other fountain pens. I think it’s a great fountain pen for constant writing. 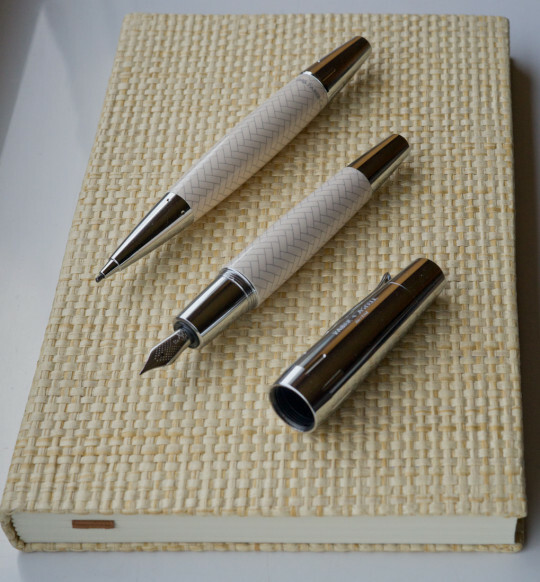 If you want a pen more suitable for meetings or other situations where you only write occasionally the short cap-off time means that a Faber-Castell’s Basic or Ambition fountain pen might be more suitable as it’s easier to cap and uncap these pens. If you want a pen with a more “substantial” feeling to it the E-Motion might just be the right pen. I was very happy that Anna and James from The Pen Company sent me these pens, but it’s time for the two pens to find a new home. For a chance to win the the mechanical pencil or the fountain pen please leave a comment at this blog post, telling me which type of pen you normally prefer (pencil, mechanical pencil, fountain pen, roller ball, ballpoint pen or whatever it may be). It would be nice if you explain why you prefer that type of pen, but that’s not necessary to be eligible to win. If your favourite type of pen is not the one you want to win, e.g. you might prefer pencils, but you’d like to try a fountain pen for a change, please state that in the comment, too. I am happy to ship to any country as long as Royal Mail is delivering to that country. The UK’s National Stationery Week runs from 22 – 28 April, so the closing date for the giveaway will be 28 April 23:59:59 BST. To determine the winner I will go to random.org and will get a random number. The corresponding comment will win the pen of choice (either pencil or fountain pen) unless it’s a comment from me or it’s obviously spam (think ‘cheap Rolex’ ads) …in which case I will get a new random numbers until there is a winner. I will then get another random number to determine the winner of the other pen. Similar rules: the corresponding comment will win if the pen left is their pen of choice – unless it’s a comment from me, a comment from the first winner or it’s obviously spam. I will draw new random numbers until there is a winner. As long as you write meaningful comments, e.g. as part of a ‘discussion’, you can leave more than one comment and the comments will not be counted as spam. 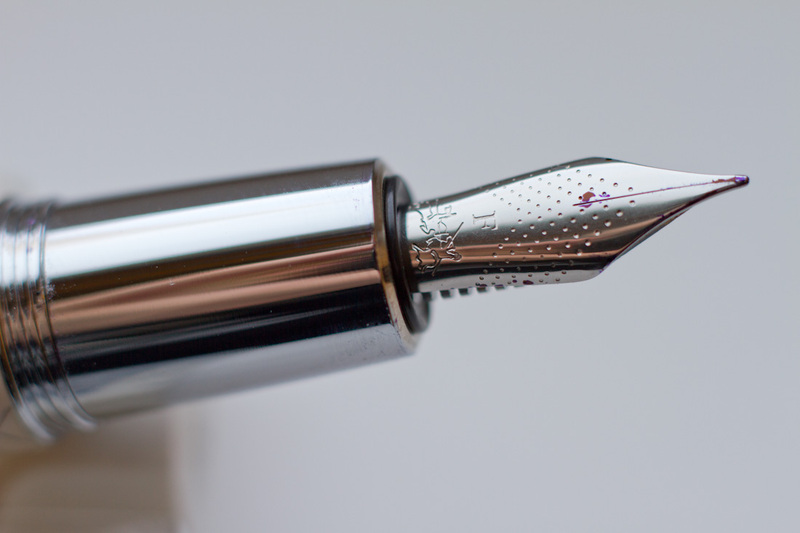 If you want to win an even better pen: as part of The Pen Company’s Spring Poetry Competition you can even win a Graf von Faber-Castell Guilloche Fountain Pen in a choice of colours. I’d like to thank Anna and James from The Pen Company for giving me a chance to try these pens out. You can find a review of another Faber-Castell E-Motion pencil at Dave’s Mechnical Pencils. 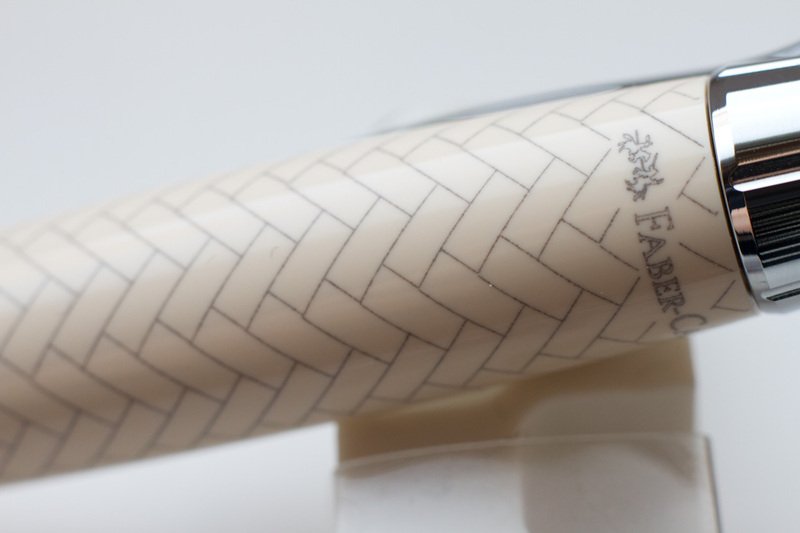 You can find reviews of other Faber-Castell E-Motion fountain pens at Fountain Pen Geeks and From the Pen Cup.